With travel and adventures to be had, Sandy and Joan Mill couldn't settle for long in a conventional city life. And their home on a large lifestyle property in Oratia with a spectacular panorama back to Auckland and the upper harbour is anything but ordinary. 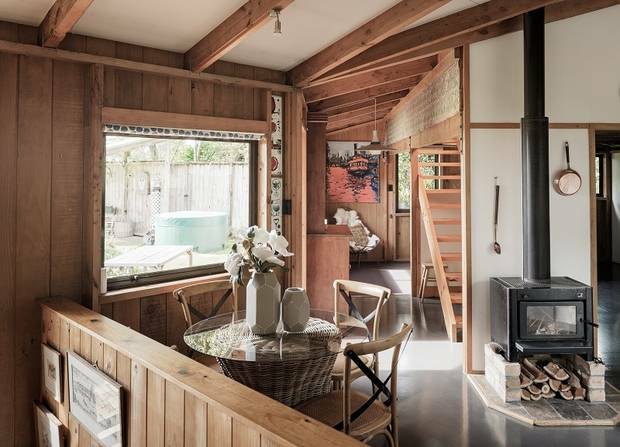 Joan was gifted the property and its little cottage by her father in 1958, before going on her OE to England, where she got together with Kiwi architect Sandy. On their return in 1960, they married and moved into the cottage, which was built in 1941. Three children and 10 years later, they headed off in 1970 to England again. Then they bought a boat and sailed back to New Zealand and life in the cottage. "It was a life changing experience for all us," says daughter Emily. Later in the 1970s, they realised the cottage was bursting at the seams. So, they cleared nearby land to build a bigger home to Sandy's design, set back at the edge of a flat platform to maximise the views and sun. At the time, Sandy was working for the Auckland City Council, redeveloping Freemans Bay and building a radical new enclave of townhouses. He was also inspired by the simple wooden houses of a Utopian project called the Sea Ranch in Northern California. "I loved the feel of it. It was woody inside with vertical boards and angles. Being an architect, you see buildings going up with timber frames and they look exciting. "Then they cover it up with gib board on top. We wanted to keep the timber effect inside. So, we developed a system of building panels and lifting them up. "They sandwiched two layers of pine tongue-and-groove with polystyrene slab insulation in between. "At the time, it was an insulation innovation," says Sandy, who won an environmental merit award for the project. Sandy and Joan built the home themselves and moved in in 1976. Emily remembers carrying beds across the lawn to her shared downstairs bedroom. It was part of an open-plan area with partitions that separated the three children. Emily and her sister Charlotte's beds were tucked into a spacious cave-like area above with desks below, while their brother Daniel slept in a loft with his own living space underneath. The partitions have since been removed and the area is the ideal office or gym, with large double garaging and a workshop next door connected via a second set of stairs to the laundry/scullery. Their parents embraced the views above the living area in a beautiful light-filled suite. With its tall ceiling and raw timber walls, the open plan living area feels particularly voluminous. It has an updated kitchen/dining room in the middle with an office at one end and the sitting area, warmed by a big open fire, at the other. Just like the Sea Ranch project, the Mills' home feels as modern today as it was when it was built. Emily says the property provided a magical lifestyle for the family and for her own children when they returned here as well. She remembers building huts in the native forest and catching eels in the creek which borders the regional park next door. Joan and Sandy continued to travel when the children left home. They rented out the cottage and the larger house whenever they went away. But now the property is too large. "Things just keep growing, which requires work," says Joan. So, they're finally slowing down and moving to a dwelling on Emily's lifestyle property in Coatesville.